Sufia Kamal (June 20, 1911-November 20, 1999) was a poet, writer, organizer, feminist and activist from Bangladesh. She was born to a Muslim family in Barisal, Bangladesh. She is one of the most widely recognized cultural personalities in Bangladesh. 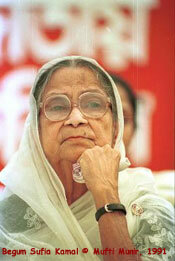 When she died in 1999, she was buried with full state honors, the first woman in Bangladesh to receive this honor. Sufia Kamal was born in Shaestabad, daughter of a distinguished zamindar family, in Barisal. During her childhood, women's education was prohibited and she could not afford to get academic education. But she learnt Bangla, Hindi, English, Urdu, Arabic, Kurdish and Persian language from her house tutors. In 1918, she went to Kolkata with her mother where she came to meet with Begum Rokeya. She was first married at the age of 11 to her cousin Syed Nehal Hossain, then a law student. They had a daughter, Amena Kahnar, and Mr. Hossain died in 1932. Five years later, Ms. Kamal married Kamaluddin Ahmed. In addition to her first daughter, Ms. Kamal is survived by two other daughters, Sultana Kamal and Saida Kamal; two sons, Shahed Kamal and Sazid Kamal; three grandsons, and three great-granddaughters. A short story "Shainik Bodhu" which she wrote was published in a local paper in 1923. She encountered prominent South Asian personalities, such as Begum Rokeya, Kazi Nazrul Islam and Mahatma Gandhi. Rokeya, who can be regarded the first female feminist of Bengal, had a lasting impression on her. Sufia Kamal's first poem, Bashanti (Of spring), was published in the then influential magazine, Saogat in 1926. In 1931 she became the first Bengali muslim female to be the member of Indian Women Federation. Kamal's literary career took off after her first poetry publication. Her first book of poems Sanjher Maya (Evening Beautiful) came out in 1938, bearing a foreword from Kazi Nazrul Islam and attracting praise from critics, not least of whom was the father figure of Bangla literature, Rabindranath. Sanjher Maya was translated in Russian in 1984. Then Sanjher Maya Russian translate is in translate of Russian. In 1937 she published her first collection of short stories, Keyar KaNta (Thorns of the Keya tree). Though she called herself a romantic poet, her work more and more reflected the struggles to preserve the Bengali language and culture and to fight Pakistani rulers. During Bangladesh's struggle for independence from Pakistan in the early 1970's she worked to help women hurt by the war. She also worked with an organization to try to bring to justice those Pakistani officials whom the Bangladeshis considered war criminals. In later life, she made women's rights her top priority and headed Bangladesh's largest women's organization for many years. She did not see the oppression of women as mainly a class issue. In 1947, when "Shaptahik Begum" was first published, Sufia Kamal became its first editor. In October of that year after the partition of India she came to Dhaka. During a huge clash between Hindu and Muslim of that time Kamal worked for their friendship and joined in Peace Committee. In 1948, when "Purbo Pakistan Mohila Committee" formed, she became its chairman. Kamal's activism continued in 1952, with the Language Movement. In 1961, when the Pakistani government banned Rabindra Sangeet (Songs of Rabindranath), she became involved in the movement among Bengalis that ensued in 1961. During the mass uprising in 1969, which demanded the resignation of General Ayub Khan, she promoted the cause by forming Mohila Sangram Parishad (Women's Struggle Group). She was involved in the 1971 Liberation War and all later movements against dictatorial regimes. Kamal was also instrumental in getting the first women's dormitory of Dhaka University to be named Rokeya Hall, after Begum Rokeya.